I would eat nachos every day if I could. I just love this dish! What’s not to love? Crispy corn chips, topped with cheese and lots of other delicious ingredients. My Loaded Nachos have a special ingredients; bacon. Yes, bacon. This is definitely a recipe to try. Those are so easy to make, and so delicious. I did not specify any quantities because there’s not really a recipe to follow. You just put the quantity you want depending on your taste, and the amount of people you’re serving. 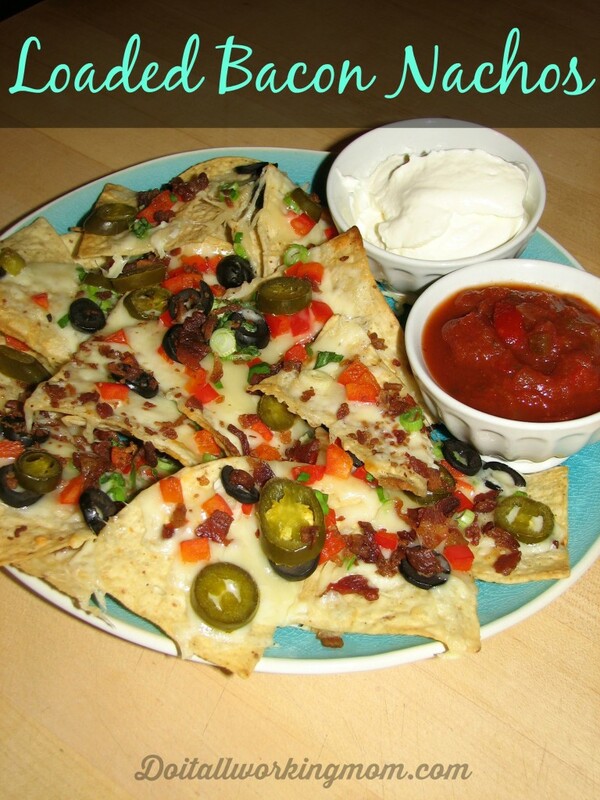 1- Place your nachos on a baking sheet lined with parchment paper. 2- Spread the grated mozzarella cheese on top, and spread the rest of the ingredients on top of the cheese. 3- Cook in a 400 F preheated oven for 5-10 minutes (until cheese is melted). You better make enough of these, because they disappear quickly! This is the perfect Super Bowl, or game night dish; you can also serve them as an appetizer. It`s so good, it`s crazy! I have this almost once a week!!! Yum- that is a delicious snack! While I don’t eat bacon, I do LOVE everything nachos, quesadillas, tacos, burritos… you get the point! These look yummy and I know they would be a crowd pleaser! Thanks for the recipe and good party idea! I just had lunch, and I’m STILL hungry after seeing this! YUM! Great recipe, I’ll have to try it. Thanks! You had me at bacon! I love bacon. And I love that these have mozzarella cheese too! I’m going to try my hand at making mozzarella cheese very soon with the fresh milk I am getting from a friends cow and this will be the recipe I try it on (if the cheese comes out OK). This post has been featured on the Hearts for Home Blog Hop. For sure it would! I’ve never tried making mozzarella cheese before. Sound delicious!